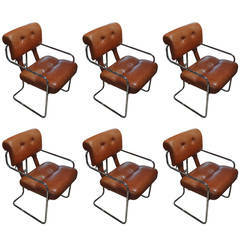 This Limited Edition, Set of Six Metallic Ostergaard Space Age Chairs, 1970 is no longer available. 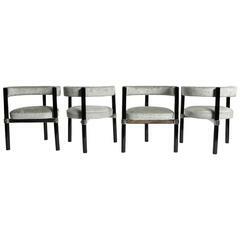 Unusual set of Ostergaard polyethylene in lacquered metallic color made by rotational molding fixed (indoor/outdoor use) chairs with new seats made of geometric woven jacquard textile fabric " Lelievre souk" Please note that we can reupholster the seats in almost unlimited options. Please ask for more information about the option our experienced craftsman can offer you. All in mint condition. A rare and unusual set. Size H 29.53 in. x W 20.87 in. x D 19.29 in. 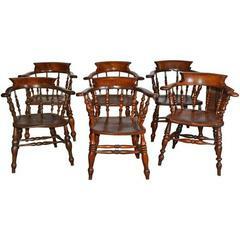 H 75.01 cm x W 53.01 cm x D 49 cm Seat height 17.91 in. (45.5 cm). 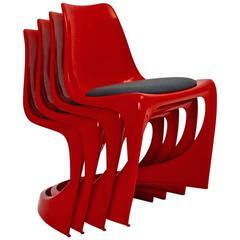 Three stackable dining chairs in dyed plastic designed by Steen Østergaard. Made by Cado, designed in 1966. Some scratches. 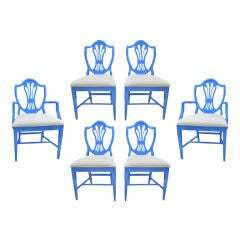 Set of six beautiful blue dining chairs, two armchairs and four side chairs, with gorgeous silver fabric.